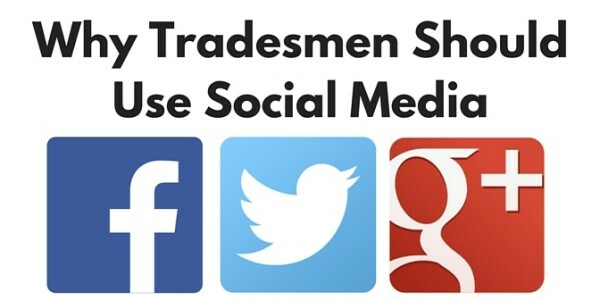 It’s well known that social media has been behind some dramatic business success stories, but is it important for tradesmen to have social media pages? Many tradesmen have set up social media pages with the impression that it’ll increase the number of leads they receive overnight, but all too often you see these pages abandoned by those who don’t see an immediate influx of work, decide it’s not worth the time and give up much sooner than they should. Setting up social media is unlikely to give you work straight away, and it does require a lot of effort and time to get right, but if you spend the time maintaining it, you will see a dramatic increase in work. A lot of tradesman work comes from word of mouth, and social media is a modern twist on word of mouth marketing. Let’s say you’re a plumber who has just installed a new bathroom. You’ve done a great job and your client is so happy that they take a picture, upload it, and show the results off to their friends on Facebook. This is not only a way for them to show off their beautiful new bathroom, it also means that your name, quality of work, and location has just been shown to a couple hundred of their facebook friends. To get the same level of publicity in a printed directory would costs you hundreds, if not thousands of pounds per month, but you’ve not spent a penny. Again, this might not result in 200 people immediately asking you to come and do work for them overnight, but whenever those people do need a plumber, you’re going to be the name that comes to mind. People buy from people and social media gives you the opportunity to humanise your business and manage your reputation. Social media gives you the opportunity to show off your business at the personal level. This gives you a clear cut way to differentiate yourself from the competition, show your competitive edge, and come across as a friendly, open, and trustworthy business. It’s also worth using social media to manage the (unfair) reputation many tradesmen have. Everybody dreads hiring a cowboy tradesman, so giving an insight into your business at the personal level can help to reassure your clients. Building a community of followers gives you a great insight into the types of people looking for your services. By figuring out who needs your services, you can understand how you can tailor the rest of your marketing towards them. Social media sites have plenty of built-in analytics which can tell you a lot about your customers. Learning how to properly utilise and react to your market is the key to understand how to sell your services effectively. Want to know more about how you can use social media to your advantage? Check out our best selling social media marketing book. Find out how to get the phone ringing again with our FREE DVD: A tradesman’s guide to getting work from the internet. Need help setting up your tradesman website and social media accounts? Get in touch with Job Done websites today on 0117 214 0421.